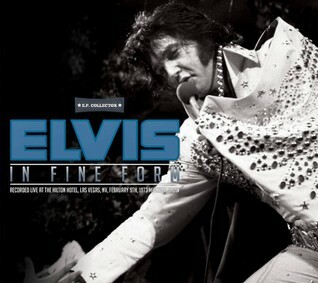 Expected soon is new CD entitled ”IN FINE FORM” (label E.P. Collector, EPC 2015-03) recorded in Las Vegas, NV, February 9th, Midnight Show. It's not often that a totally "unknown" concert recording turns up, so we are rather pleased to be able to release this unreleased audience-recorded tape for collectors worldwide. And a rather nice one it is too, with EP in fine form and presenting a more solid and vocally satisfying show than at some of the other shows from this engagement. This tape, recorded during the February 9th, 1973 midnight show, it's very good-sounding recording, and Elvis' strong, no-nonsense delivery that night makes this release a worthwhile addition to your collection! The CD is packaged in a nicely designed digipak with some less-known, cool images taken on January 14, 1973, in Hawaii. 01. Also Sprach Zarathustra (2001 Theme) - 02. C. C. Rider - 03. Medley: I Got A Woman / Amen - 04. Love Me Tender - 05. You Don’t Have To Say You Love Me - 06. Steamroller Blues - 07. You Gave Me A Mountain - 08. Fever - 09. Love Me - 10. Blue Suede Shoes - 11. Heartbreak Hotel - 12. Johnny B. Goode - 13. Hound Dog - 14. What Now My Love - 15. Suspicious Minds - 16. Band Introductions - 17. I Can’t Stop Loving You - 18. An American Trilogy - 19. Can't Help Falling In Love - 20. Closing Vamp.